Decided to open the topic early. The contestants are allowed to post their concepts on here. They can either post their full uniform set, or even just a teaser. This is just for discussion and where your opponent will be named (later next week). The poll for Round 1 will be set up one week from today. Alright, what the heck, you know? Keeping the ties with the traditional red, white and blue, but darkening them, into a deep navy, a pure red, and adding a dark silver, the newly designed primary logo sits the traditional "Texas Star" on the beautiful skyline of Austin, TX. Going very modern, the striping flows like the Colorado River that Austin is situated on. The secondary logo is the State of Texas with the same navy and white Texas Star from the primary sitting over Austin, showing not only all of Texas but all of the NHA just who Texas belongs to. With a lack of a distinct look, the Knights have come back to what was very possibly the inspiration for the name, the city coat of arms. Reworking the coat into a simpler, more ready for prime time look, adding hockey pucks where gold coins used to sit, this unique primary isn't the most distinct thing about the entire look. The colors, black and gold, are a mainstay in Pittsburgh sports and helps the team fit in with the city's overall athletic aesthetic. Notable, the white lance, going down the side of the shell sitting inside a yellow triangle, and the blue and white checkerboarding used for striping. This look is something that is taken very proudly in Pittsburgh, and the use in the Knights scheme makes this a uniform that stands out in the NHA crowd. 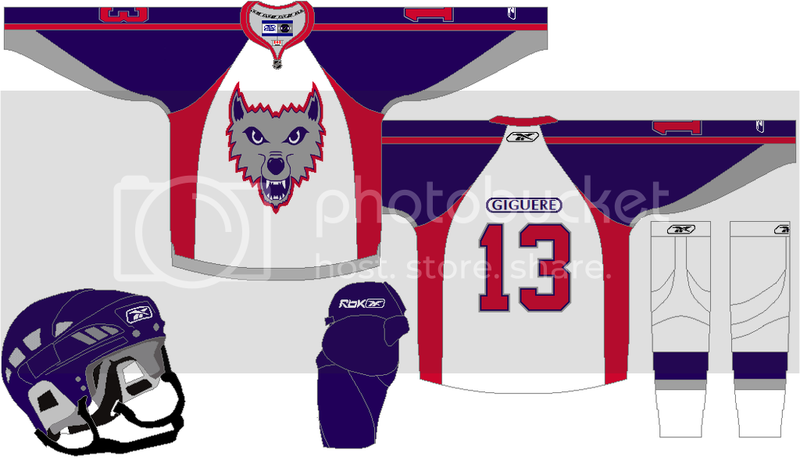 In addition, the decision was made to not produce a white jersey, rather, using a nice piercing gold when other teams don their darker attires. First off, the Denver Explorers. Keeping the brown and black color scheme, "Petey the Pioneer" returns as a pseudo-Teddy Roosevelt mountain man wielding a hockey stick. The mountains reach up the sleeves for unique touch. This concludes my half-intelligent sounding write up lol. Next up are the Detroit Turbos. They bring back the sea green, but lose the gold in favor of black. The logo is metallic, turbo-charged goaltender from hell... on wheels. The logo was designed to strike fear into the souls of any forward who dared attempt a shot on goal. The race inspired checkered flag adorns both his equipment, and the team's uniforms. The alternate logo simply consists of the 'D' from the primary, and from the wordmark. The numbers and shoulder patch were placed on only one sleeve, in favor of a checkered flag the length of the opposite. 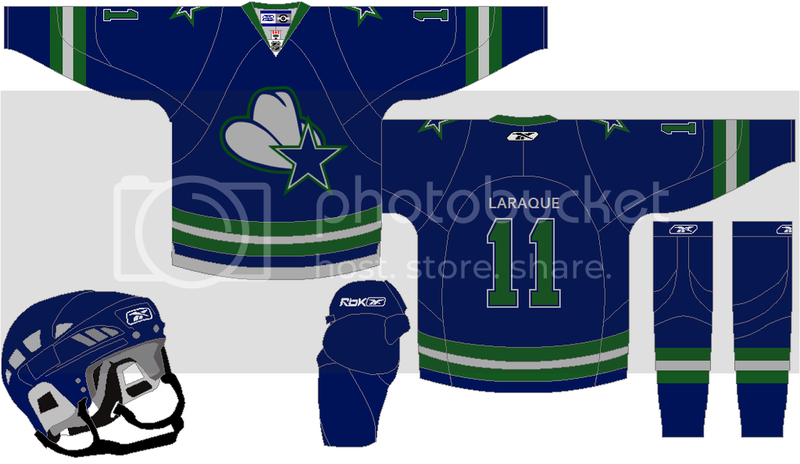 This was done to make the team stand out from the crowd, as few pro franchises have adapted non-symmetrical uniform designs. That is spectacular! I love it! Here is the first of my teams, I present the Chicago Ducks. 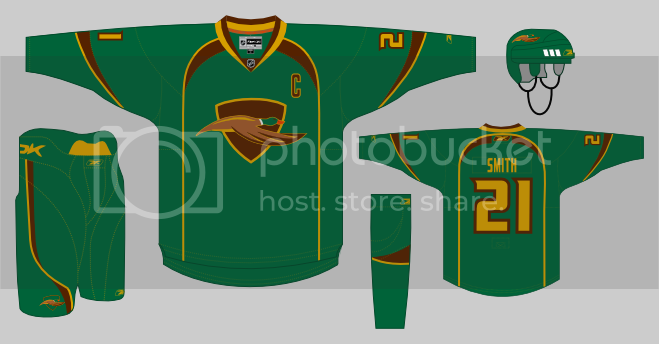 For those green Duck jerseys, I think the logo gets really lost. Thanks, I just made an edit I hope that looks better. 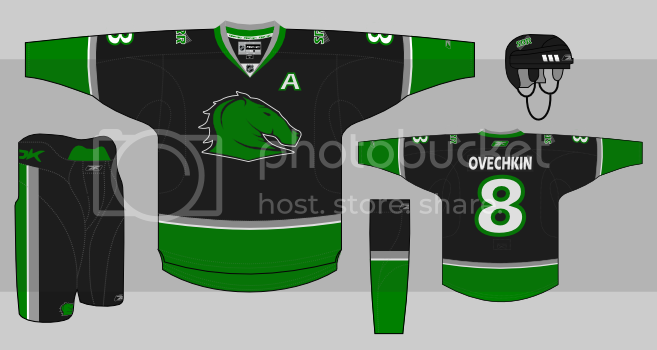 Anyway, here's my next team, the Seattle Rough Riders. Here is my first team. The Minnesota Warriors. 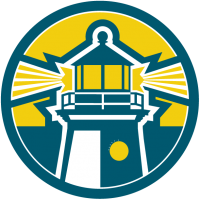 not to take this thread off topic for too long, but what is the NHA? if anyone wishes to explain this to me feel free to PM me so that we don't take the thread too deep into a tangent. Sorry for the brief deviation. See page 2 for both of my teams, the Rochester Wings and Arizona Storm. I reposted the Wings there so that both of my teams will be in one post. My reasoning is because I think it will be easier to follow this way. May I make a suggestion for the Wings? I've lived in Rochester my whole life, and when I saw the name was Wings, I thought it was based off a building a lot of people around here like (I love it), the Time Square Building. I think for a secondary or something, you could incorporate that into it. Just a suggestion. I say meh to the blue checkers. Yeah, theyre on the crest...but dont work well on the uniform. 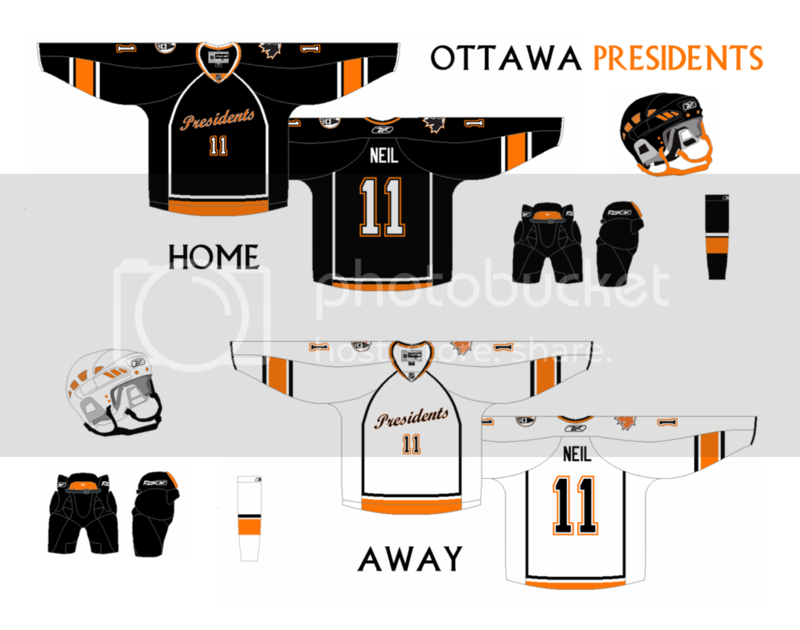 Maybe since oyu already altered teh crest by replacing the coins with pucks, maybe you could just make the checkers gold and change it like so on the jersey? 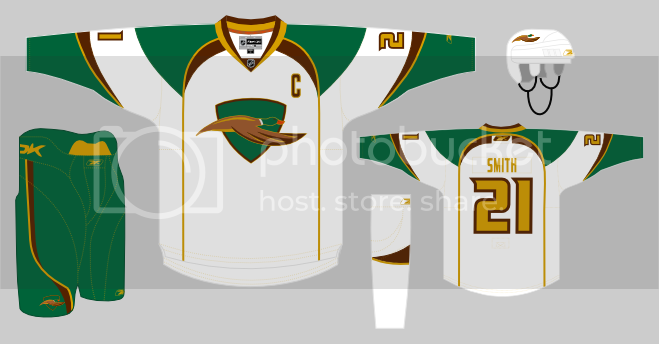 Or, maybe, make the bottom of the jersey, form where you hav ethe top of the checer stripes down, gold on the black one and black on the gold one? Maybe even no hem stripes whatsoever? Putting black on the sleeves as opposed to white on the gold jersey would also look better, IMO. And the sheath looks alittle corny. Also, black helmet with black jersey would also look better. Maybe a different number font wouldnt be a bad idea either. Also, to clarify (not that i think you confused this but for anyone else who did), Black and Gold were the city's official colors since it first started back in 1758, generations before any of our sports teams adopted them, as they were the colors of the Pitt family. Question? 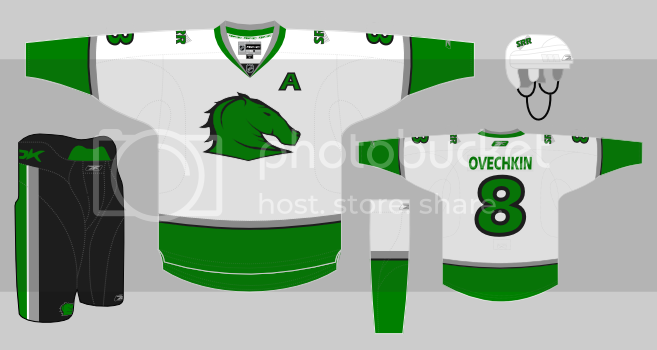 For the jersey set do we need anything other than the jerseys? ie do we need socks, pants, helmets ect. 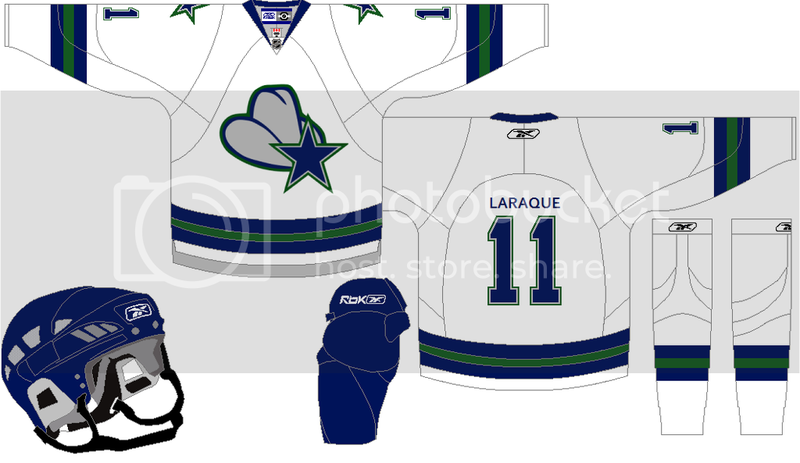 Just the jersey, though adding socks, pants and helmets would obviously "liven" up your concept a little more and make it more competitive. I'm pretty impressed by all the work put out so far. Good work, to those who've submitted entries. Okay, I'm done with mine. 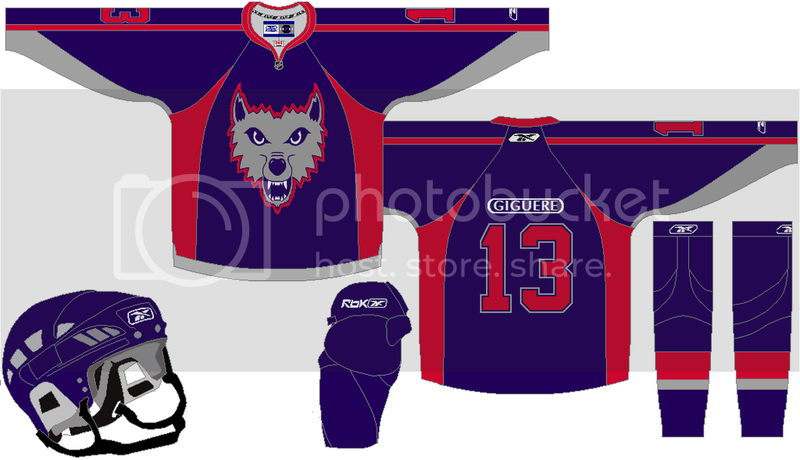 First off I have the Buffalo wolves, I've decided to keep the colors of blue, grey, and red but with a modernized look. Second, I have the Montana Cowboys. I went with a classic logo and stripe pattern. I eliminated the black and replaced it with a darkish green.